The National Front is a far-right, whites-only political party whose major activities were focused on the 1970s and 1980s. It was founded in 1967 from a number of racist groups including the Racial Preservation Society, with the aim of opposing immigration and multi-culturalism in Britain. The NF describes itself as a "Racial Nationalist Party" - and says it wants a halt to all non-white immigration to Britain and the forced repatriation of all people of non-European descent. Its website attacks the BNP for "admitting the Holocaust in the face of the evidence". In the 1970s it was known for its violent demonstrations, particularly in London, where it often faced anti-fascist protesters from opposing left-wing groups. Hundreds of police officers and demonstrators were injured in marches during this period, when the party was led by John Tyndall, a white supremacist who later went on to form the BNP. The party says it stands for "white family values" and the "Fourteen Words", a white nationalist slogan that states: "We must secure the existence of our people and a future for white children." Its policies include the recriminalisation of homosexuality, repealing the 1967 Abortion Act and the withdrawal of Britain from the EU and Nato. The prison service and police currently forbid its employees to be members of the party. After the 1979 general election, where the NF received 0.6% of the vote, the party was nearly bankrupted when more than 300 candidates' deposits were lost. In the 1983 general election the National Front vote fell from 191,000 to 27,065, and the party effectively split in two. On one side were young members such as future BNP leader Nick Griffin, who had little interest in contesting elections and wanted to devote all their time to bringing about nationalism through "revolution". The other faction argued that the NF should continue fighting elections and playing on populist and racist sentiments. Mr Tyndall was expelled over the NF's financial difficulties. He went on to form the British National Party. The National Front fielded little more than a dozen candidates in each of the general elections in the 90s, and its vote share dropped from 0.1% in 1992 to 0% in four ballots from 1997. 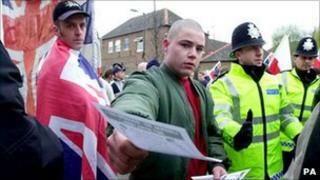 In February 2010, when the British National Party had to change its constitution to allow non-whites into the party because of a High Court decision, the NF claimed to have received more than 1,000 membership inquiries from BNP members. The party is this year standing for the first time in a Scottish election, fielding five candidates, four in the north east and one in the Linlithgow constituency.